There was a telling moment in the Cape High Court murder trial of Shrien Dewani last week when one of the alleged conspirators, shuttle operator Zola Tongo, in an unguarded moment, suggested he too was a merely victim and not the master of his own destiny. In making the admission he joined the ranks of several other prominent South African men who claim victimhood rather than taking responsibility for their actions. By MARIANNE THAMM. Zola Tongo has spent the last four years of his life behind bars. And it has not been easy, he made sure to inform the court. The father of six is currently serving an 18-year sentence for his part in the murder of Swedish tourist Anni Dewani while she was on honeymoon with her husband Shrien in Cape Town in 2010. Tongo handed himself over to police soon after the shocking crime. 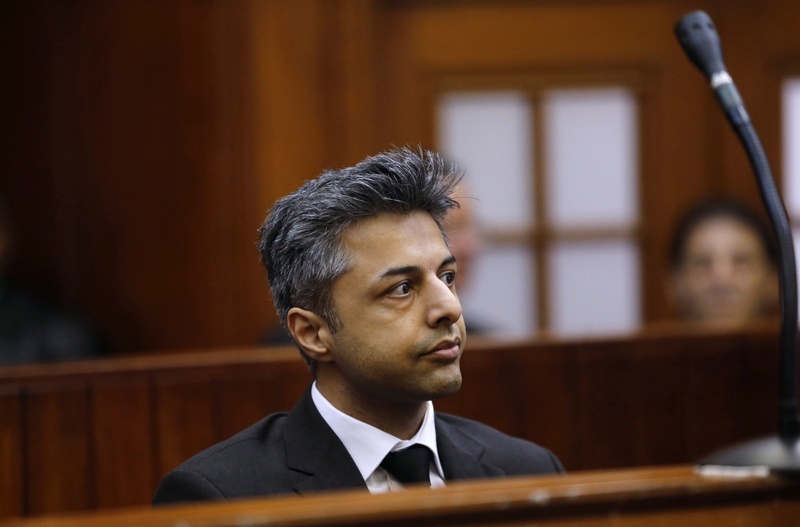 He pleaded guilty and offered to testify later at the hearing of the prime suspect, Shrien Dewani, whom Tongo fingered as the masterminded behind the entire fake hijacking, robbery and murder. Tongo, weighing up his future prospects, was either advised or chose to take the path of least resistance. Coming clean would mean a lesser sentence and the possibility of an early parole. The alternative would have resulted in a lifetime behind bars due to the gravity of the crime: kidnapping, robbery and murder. The reality is that there is only one victim here – Anni Dewani. Her absence is manifestly present in Court 2 where her family quietly sits on the wooden bench, day after day listening to the evidence unfold. The small laminated photograph of a smiling Anni the Hindocha family and friends wear pinned to their clothing is the only trace left of the woman she once was. There is an unsettling moral and ethical disjuncture that has emerged as Tongo has given evidence. Here is a man who had never committed a crime or been involved in criminal activity who, when he found himself, not by choice, drawn into lethal and terrible plot could not find it within himself to do “the right thing”. “Why did you not get into your car and forget about it and carry on with your life?” Dewani’s senior counsel, Advocate Francois van Zyl, asked Tongo. “Because of the promises of work,” Tongo casually replied. Surely most reasonable, ordinary people, when asked by a complete stranger to procure the services of a killer to eliminate another stranger, would drive to the nearest police station and report it? Have we become so habituated to violence that some of us are morally paralysed, unable to access even the most basic notions of right and wrong? Have we surrendered so totally to an economic system that pits individuals against each other in a titanic struggle for survival, a system that calls for and is based on the exploitation of other human beings, that we have lost our humanity? Or has our awful history, where a white minority used the Bible to legally and morally justify the most heinous violations of human rights, so corroded our psyche that we are unable to find our way through the ethical impasse? Have the efforts at healing of leaders like Nelson Mandela and Desmond Tutu to restore our humanity been totally and completely in vain? Did the TRC, or the collective project of forgiveness, inadvertently corrupt our moral compass? Did forgiveness trump justice and in so doing serve to merely bandage a festering wound? Or perhaps this is this just how we – as a species which possesses consciousness and the ability to make moral choices – are hardwired? Maybe this is just the way we are. Playing the victim is, of course, an ancient strategy to avoid taking personal responsibly or facing consequences. The Christian Bible, in the Old Testament, kicks off with a man who refuses to take responsibility for his transgressions. Adam, when his creator discovers he has “eaten from the tree of knowledge” immediately blames Eve. Eve, in turn, blames the talking serpent. However, neither deflection serves to halt their having to face the ultimate consequences. Both Adam and Eve are banished from paradise, doomed to suffer for all eternity. Because so many individuals frame their moral or ethical compasses on these stories, myths and texts, these become lodged in our unconscious. And the effects have been lethal for women who have for centuries been “blamed” for the “downfall” of “man”. Of course the entire tale is a metaphor and the real lesson lies in the story’s denouement – victim or not, Adam and Eve pay the price for the choices they have made. That this pertinent aspect of the story is seldom highlighted is telling. Last week after hours of gruelling cross-examination by Dewani’s senior defence counsel, Francois van Zyl, Tongo, who had been fielding questions claiming to have naturally made “mistakes” because of his many lapses of memory, momentarily lost his composure in the witness stand when he misunderstood Van Zyl. “What trouble did you go to, to get Monde’s [the fixer who hooked Tongo up with the two assassins] services?” asked Van Zyl. “I went to a lot of trouble. I used MY phone to phone Monde; I used my petrol. I sacrificed my life for this to happen. There are many troubles I went to,” Tongo angrily replied. Tongo did not have a gun held to his head. In that instant he could have made a different choice but the promise of money, an alleged R5,000, is what motivated him in the end. It is what blinded him to the horror of the crime he was about to facilitate. Or perhaps there is a more complex explanation we will never explore in court. There was only one life sacrificed, Anni’s. South Africa is awash with narratives of victimhood by alleged perpetrators. There is the collective victimhood of some white South Africans who now claim they “suffer” in democratic South Africa. There are even white South Africans who claim to be “victims” of Apartheid, suggesting that their unquestioning complicity with the system has “traumatised” them. They had no choice, they cry, in the oppression of others. “We were following orders”, “we didn’t know”. These are all narratives that have re-emerged in post-Apartheid South Africa as well in one form or another. Is it just human nature to locate the source of our discomfort or predicament outside of ourselves? And what is it that contributes to this mindset? In deflecting or avoiding responsibility for our transgressions we lose sight of the real victims, Anni and other women (and men) who are murdered by those shouting “victim”, the poor who are robbed of services by those who divert revenue from the fiscus, the lives lost to those who choose to drive under the influence…The list is long and depressing. Perhaps there is some comfort in the knowledge that the courtroom setting removes those members of society who have transgressed from among us and places them within a public arena where they can be scrutinised.